John Cecil Caesar, aged 51/2 years, being drowned in the river at the bathing place known as “Athens”. Rather surprisingly the lad was a pupil at Eton Porny School, and was walking home along the river bank with another five year old and decided to paddle at "Athens". Young Caesar's socks fell in the water and while trying to reach for them he toppled into the river. Almost all village boys would not have gone to "Porny" until they were seven years old, and of course it was well over 1½ miles from Eton to John's home, via the river path. His father, Albert, gave evidence of identification at the inquest held in the Three Horse Shoes public house. Mrs Caesar's tragedies were not yet over though. John was drowned on May 18th 1914 and in less than four months Albert, her husband, was to become Eton Wick's first fatal casualty of the war. A third time tragedy struck with the death of baby Edith May who was buried in the village churchyard on April 14th 1915. 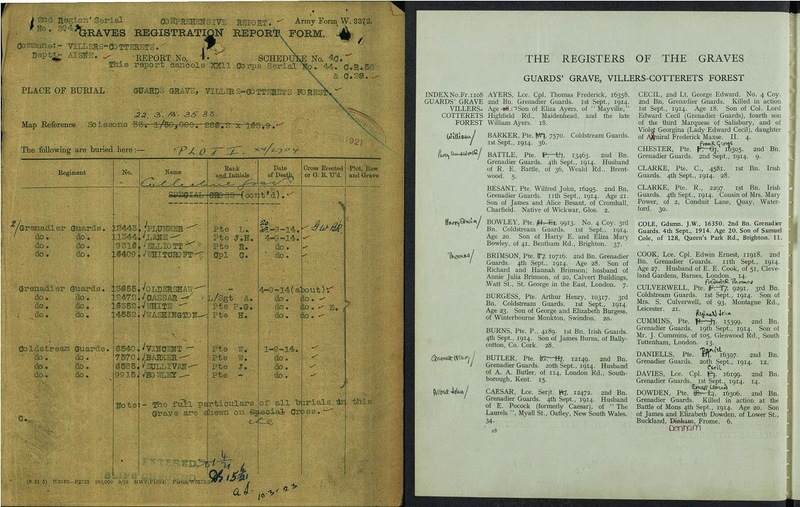 As with all reservists, Albert would have reported for duty immediately war was declared. Eleven days later, August 15th 1914, the 2nd Grenadier Guards arrived in Havre. By August 22nd 100,000 men had been shipped to the continent, and although this represented most of the troops available it compared poorly with our French ally's army of four million troops, or with Germany's 4½ million. The British forces were formed into I and II Corps. With long marches they pushed quickly north into Belgium, in an attempt to stem the German advance south through that country. On August 23rd the opposing forces met near Mons. Mounting pressure against French forces on the through the forest of Villers Cotterets, while the 2nd Grenadiers and the 3rd Coldstreams took up defensive delaying positions in order to cover the 2nd Division's retirement behind them. At mid-morning, the 2nd Grenadiers sent a company of men forward to support the Irish Guards, but the rapid advance of the enemy negated any chance of success. By this time the three British Battalions in the forest had become hopelessly intermixed, causing many self-casualties. It was here, while trying to delay the German advance, that Albert Caesar was killed. The C.W.G.C. record his death on September 4th, despite the fighting being on the 1st. He could have died of wounds sustained on the 1st, or perhaps his remains were not recovered until the later date. The German's drive for a quick victory was halted on September 5th on the river Marne, and determined allied counter attacks caused the enemy to strategically withdraw to entrenched positions on higher ground. The British losses in the first five weeks of war were 15,000 and the French casualties an estimated 250,000. A.J. Caesar, Sergeant, 2nd Battalion; Grenadier Guards - of 4 Shakespere Place, Eton Wick was killed in action 1.9.14 at Villers Cotterets Forest". It has been officially reported that Albert John Caesar has been killed in action. He was greatly respected by all who knew him. He leaves a widow and three children to whom we offer our deep sympathy in their great loss. Albert's age has not been established but was probably 30 to 35 years. His widow married again and became Mrs E. Pocock living at 9 The Laurels, Myall Street, Oatley, New South Wales. 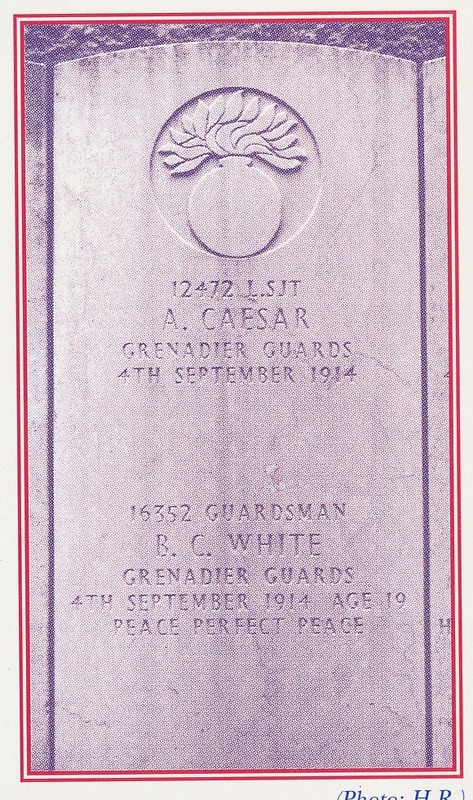 Albert is buried in Guards Cemetery, in the Villers Cotterets Forest, 2½ miles north of the village of that name. The small cemetery contains 98 graves of Grenadiers, Life Guards, Coldstream and Irish Guards, all killed between September 1st and 19th, 1914. Albert is also commemorated on the Eton Wick Memorial and the Eton Church Gates. Further information about Albert Caesar can be found here. Albert Caesar's page on the Imperial War Museum Lives of the First World War project website. 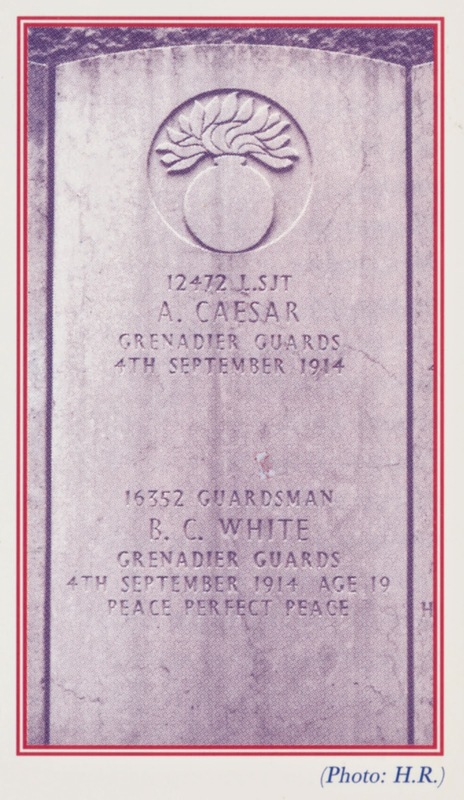 Just for the sake of historical accuracy could I suggest that a note be added that Albert is not buried in a double grave but in fact is in a communal grsve (ie Guard's Grave) along with his fellow soldiers. Each headstone has two names on it, there not being sufficient space for single headstones. 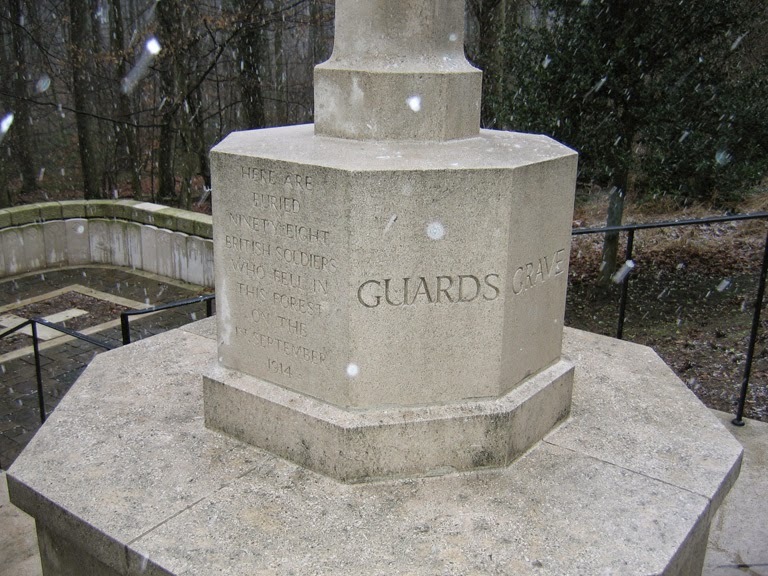 The headstones at Guards Grave do not mark the position of graves. How do I know all this. Firstly, I held an executive post in the Commonwealth War Graves Commisions Records Department in Maidenhead. Apart from that I have visited the site many both in connection with that job and my family have also been there many times because the youngest casualty buried there, Lance Corporal Thomas Frederick Ayers, aged 17, from Maidenhead is my great uncle. He is the first of the dead listed in the CWGC list on this page. Apart from all that the CWGC list above bears the manuscript heading "Collective Grave". No disrespect is intended towards Mr Bond's wonderful book. It is just a fact of life that as soon as a book is published new information comes to light. All I am suggesting is that an additional note be added to clarify. Hello Denis, Thank you for your comments about Albert Caesar. The information you have provided is most helpful. I know from the conversations that I had with Frank Bond about new information that I discovered in preparing for the other service men whose names appear on the Eton Wick War Memorial that he was always happy hear about it. I have removed the caption from the photograph. Eton Wick prefabs, built 1946-47. Why Eton Wick still has its commons.